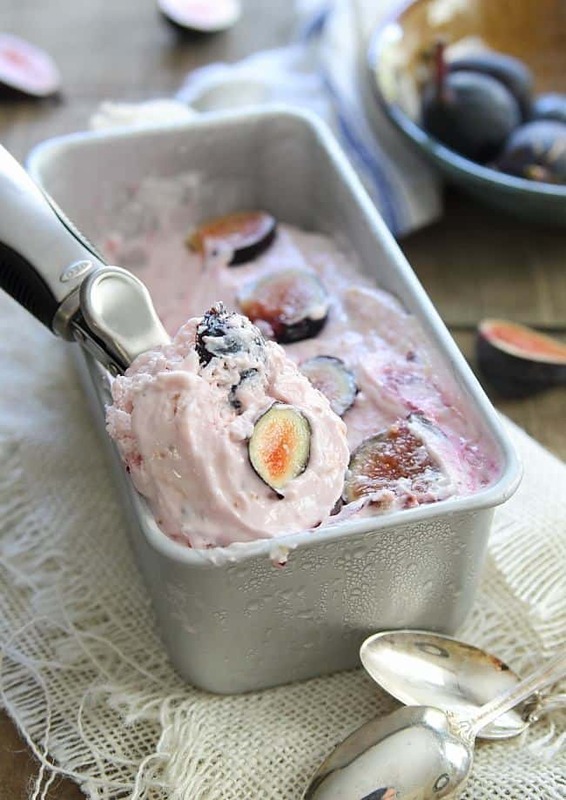 This goat cheese frozen yogurt with honey roasted figs is tangy, just slightly sweet and the perfect summer treat. Ok, so it’s September 2 and although I’m schlepping through Milan right now after a red eye (which I can guarantee I didn’t sleep on) trying to figure out which 3 trains will get us to Santa Margherita for the next 4 days, I will bet ANY amount of money that the internet world is abuzz with PUMPKIN this! and APPLE that! And I just flat out refuse to buy into that crap quite yet (although there may be one or two of those things coming in the next week or so) just because Labor Day is now behind us. Listen people, in the real world (like the one you’re actually living in, not the one you’re pretending to be in on pinterest) tomatoes are still inundating backyard gardens, the zucchini takeover is real, apples are just starting to come in season and figs are superfluous. So, let’s live in that world for a few more days/weeks if we can, ok? I hate this “rushing through the seasons to the next best thing” that the internet facilitates. I refuse to wish away deliciously ripe tomatoes when 4 or 5 months from now, I’d give anything for one. You have to really like figs to buy figs because they might be the fastest fruit to mold on this planet. I plowed through 3 pints of them in 3 days last week and that’s only because 1 of those pints got roasted for this goat cheese frozen yogurt. If you love the tang of plain frozen yogurt from those self-serve places, you’re going to LOVE this. The goat cheese gives it that perfect tangy-ness while the roasted figs bring a hint of sweetness and a gorgeous pink tinge to the whole thing. Toss figs with 2 tablespoons of the honey and lay flat on a baking sheet. Roast for 10-15 minutes until they start to shrivel and caramelize. Whisk the yogurt, goat cheese and remaining 2 tablespoons honey together in a large bowl until smooth. Refrigerate for 1 hour. Pour yogurt mixture into your ice cream maker and churn according to ice cream maker directions. Add the roasted figs at the end and churn another 1-2 minutes until just combined. Transfer mixture to a freezer safe bowl or tin and freeze for 1 hour until just set. It will be the consistency of a firmer soft serve at this point. Keep frozen but defrost for about 10-15 minutes before serving to soften. Cheers to savoring summer! I’m with you. Ice cream until the end! This recipe looks incredible! YUM!! I love that you used figs in this. Sounds amazing. Love this recipe. 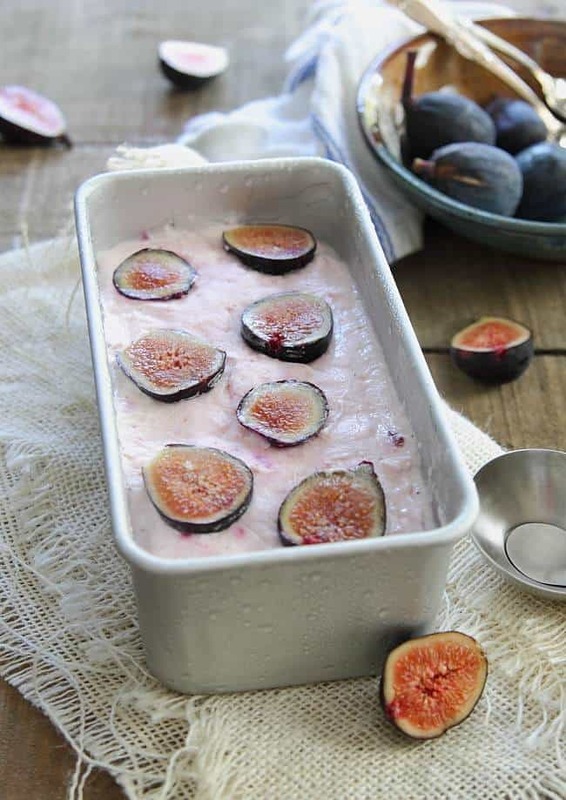 I am a huge fan of fresh figs and always looking for great ways to use them up, besides just eating them straight from the container. Ohhh this looks so amazing! This frozen yogurt looks amazing! LOVING the addition of goat cheese…yum! This is so beautiful!!! I adore the goat cheese + fig combo too. Looks like such a treat! This flavor combination is PERFECT! Love the idea of adding the tang of goat cheese!!!! I’ve made goat cheese cheesecakes before but have yet to try it in ice cream. 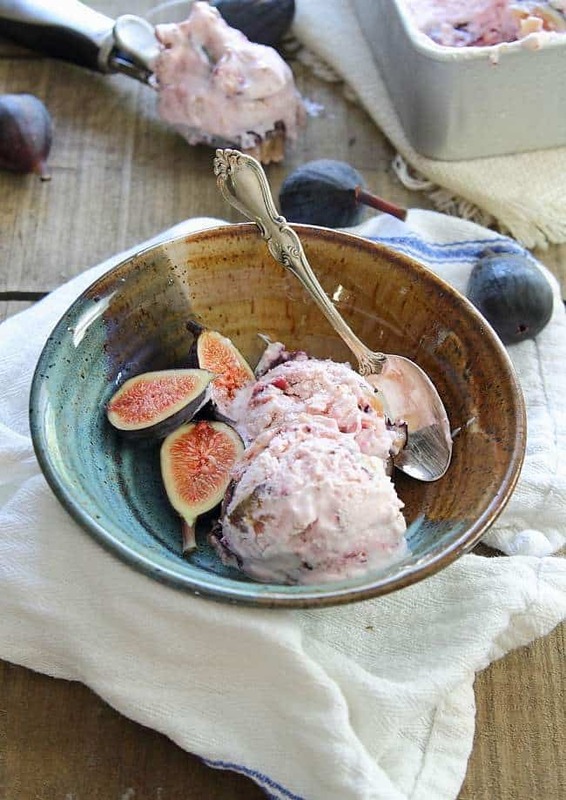 I love the idea of it with figs! Goat cheese and figs — two of my favorite things! Wow! This looks absolutely amazing. I love everything about it. Goat cheese. Figs. Honey. Rosemary. I die! I’m also loving that it seems pretty low in sugar. Can’t wait to try this!